Jan Gerrits van Emden: born 30 April 1561, probably at Emden, was of a serious nature from his early youth; at the age of 36 he was made preacher of the congregation at Appingedam. Nine years later, driven away by the Spanish war, he settled in Haarlem, where he again preached. His service there was saddened by strife in the congregation, which he vainly attempted to settle. He then undertook a journey to the Prussian and Austrian congregations in Moravia. In 1607 he was appointed as preacher of the United Frisians, High Germans, and Waterlanders at Danzig, and about 1612 became elder at Marcushof, serving with great blessing to Danzig and the neighboring churches until his death on 7 April 1617. 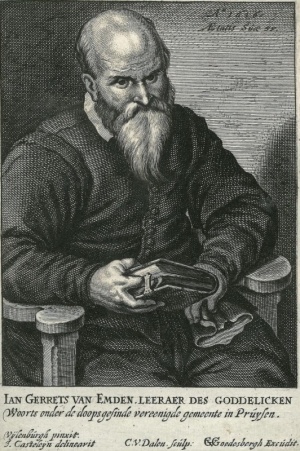 During his eldership the Polish Brethren or Socinians of Danzig, whose leader was Ulrich Pius Herwart, caused him much concern. They tried to merge with the congregation of Jan Gerrits, but the Mennonites, who rejected Socinian doctrines, tried to keep aloof; Jan Gerrits wrote a number of letters to the Dutch Waterlander leader Hans de Ries, asking his advice and requesting him to come over to Danzig to aid them in the disputes with the Socinians, which de Ries, however, declined to do. After his death some books and two letters were published, Vijf stichtelijcke predicatien (1st ed. lost; 2nd Amsterdam, 1650). One of the letters is addressed to all his children, the other to his oldest son in Haarlem. "Both letters are full of fatherly, sincere, and emphatic words of comfort." His sermons testify to a zeal to win souls to Christ by God's grace; they deal exclusively with eternal ruin of man and the saving grace of God, based solely on the sacrificial death of Christ. He is also thought to have been the author of Stichtelijke Gebeden en Meditatien, dewelke mede ter zee gebruikt kunnen worden (n.p., n.d.), which others ascribe to Hans de Ries, and of Een Vermaen-Boeckjen . . . met 42 Schriftuurlycke Liedekens (Amsterdam, 1641, 2d ed. 1648, 3d ed. 1655), of which also Jan Gerrits, the old Flemish minister of Amsterdam, is said to have been the author. In the 1650 edition of his sermons and letters three other sermons besides a very interesting formulary for baptism and communion, and several inspirational prayers of unknown authorship have been added. With all his simplicity of spirit he was not hostile to science. Thus, though uneducated, he knew the German and Latin languages in addition to his native Dutch. Cramer, Samuel and Fredrik Pijper. Bibliotheca Reformatoria Neerlandica. The Hague: M. Nijhoff, 1903-1914: VII, 190-191. Hege, Christian and Christian Neff. Mennonitisches Lexikon, 4 vols. Frankfurt & Weierhof: Hege; Karlsruhe: Schneider, 1913-1967: v. II, 83. Hoop Scheffer, Jacob Gijsbert de. Inventaris der Archiefstukken berustende bij de Vereenigde Doopsgezinde Gemeente to Amsterdam, 2 vols. Amsterdam: Uitgegeven en ten geschenke aangeboden door den Kerkeraad dier Gemeente, 1883-1884: v. I, No. 472; v. II, Nos. 2624 £., 2925-27, 2931-35; II, 2, No. 691. Kühler, Wilhelmus Johannes. Geschiedenis van de Doopsgezinden in Nederland II. 1600-1735 Eerste Helft. Haarlem: H.D. Tjeenk Willink & Zoon n.v., 1940: 53-54. Kühler, Wilhelmus Johannes. Het Socinianisme in Nederland. Leiden : A.W. Sijthoff’s, 1912: 106-108. Mennonitische Blätter (1860): 12; (1904): 3. Schijn, Hermann. Aanhangzel Dienende tot den Vervolg of Derde Deel van de Geschiedenis der Mennoniten .. . in het welke noch Negentien Leeraars der Mennoniten . . . Amsterdam: Kornelis de Wit, 1745: 42 ff. Visscher, H. and L. A. van Langeraad. Biographisch Woordenboek von Protestantsche Godgeleerden in Nederland. Utrecht, 1903- : III, 227. Neff, Christian. "Gerrits van Emden, Jan (1561-1617)." Global Anabaptist Mennonite Encyclopedia Online. 1956. Web. 26 Apr 2019. http://gameo.org/index.php?title=Gerrits_van_Emden,_Jan_(1561-1617)&oldid=144148. Neff, Christian. (1956). Gerrits van Emden, Jan (1561-1617). Global Anabaptist Mennonite Encyclopedia Online. Retrieved 26 April 2019, from http://gameo.org/index.php?title=Gerrits_van_Emden,_Jan_(1561-1617)&oldid=144148. Adapted by permission of Herald Press, Harrisonburg, Virginia, from Mennonite Encyclopedia, Vol. 2, p. 504. All rights reserved.